I stumbled upon this video blog over at We Are The Media, the new blog about video blogging. Graham Walker's TravelVlog is a brand spanking new video travelog by Gaham Walker, a Candian living in Prague and currently traveling in Tibet. So far there are just four or five videos, but they are all absolutely amazing. 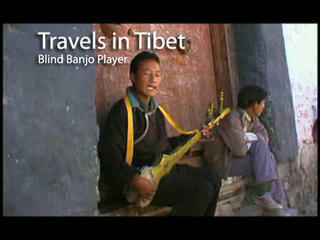 There are no voice overs, just simple classic editing, a short well written introductory post and the sights and sounds of modern Tibet in a nice high definition format. It was hard for me to pick a particular clip to entice you with, but the following clip of a blind banjo player was particularly captivating. Be sure to check out Graham Walker's travelVlog in it's entirity. And if I may recommend, download FireANT and subscribe to his video feed so you don't miss any of his future videos. Remix? I didn't see anything about a remix? Can he play Stairway to Heaven?